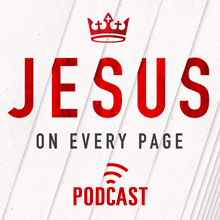 The Jesus On Every Page Podcast will build on the content of the book and will be your one-stop-shop for the best in Old Testament resources. We’ll review books, highlight great sermons, link to blog posts, interview guests, and answer your questions. And, like the book, it’s all pitched at a popular and practical level. You can subscribe to the podcast via iTunes or subscribe to the blog by email to make sure you never miss an episode. Jesus On Every Page: Free as a Bird! Jephthah’s Perfect Vow was outstanding and very much appreciated! I saw a tweet from Dan Phillips about this episode and I decided to check it out, as this topic of Jephthah has always left me asking questions. The first few minutes of the podcast had me hooked and by the time you finished making your points why Jephthah did not make a rash vow and seeing Christ alive in the Scriptures, I started downloading your previous podcast. Looking forward to your next podcast and adding your book Jesus on Every Page to my library. Thanks Rick. Glad it was a blessing. When is the next Jesus On Every Page Podcast? These have been extremely helpful! Thank you! I’d love to hear more podcasts!